Still Struggling with Silos? One Solution is Simple. 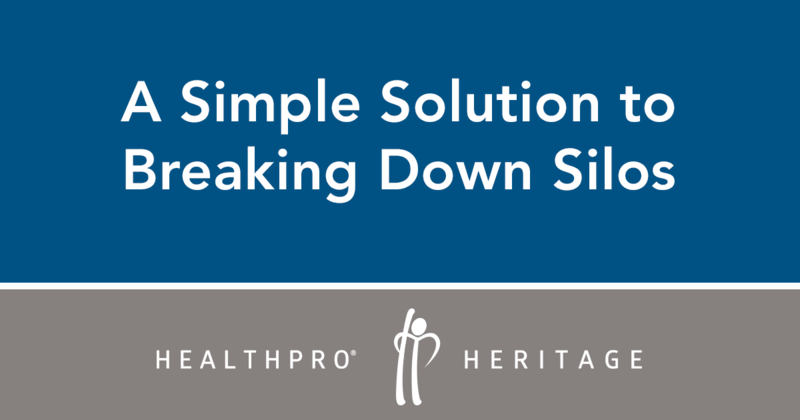 At HealthPRO®/Heritage, we understand that sometimes the most effective programs, although simple in concept, are not always easy to implement. Clinical Grand Rounds, a grassroots, patient-centric, evidence-based clinical approach is a perfect example of a simple, yet effective solution to tackling the common hurdle of silos in a SNF. Typically organized by the facility’s Rehab Team, Clinical Grand Rounds take place at regular intervals (e.x. : once per week; once per month) and require a representative from several departments to meet at a resident’s bedside. While it should be required for nursing and therapy staff; including the resident’s physician, nurse practitioner, case manager, recreation therapist and/or nutritionist/dietician is helpful. Grand Rounds may also include environmental services to address issues related to a resident’s room, equipment, etc. For example, consider the value of having issues related to the physical plant – like a broken TV or a dripping faucet – being solved right away. The primary purpose for Clinical Grand Rounds is to comprehensively and holistically address the current needs of the resident. With a solutions-oriented approach, this “concierge-level” of attention should be a collaborative effort. With meaningful interdepartmental communication, medical, therapeutic, functional and lifestyle issues can be addressed and resolved. Based on HealthPRO®/Heritage experience, Clinical Grand Rounds can be very effective in facilitating consistent communication practices necessary to eliminate silos and ultimately enhance efficiencies, mitigate risk, and improve resident satisfaction and outcomes. The ability to execute on this simple tactic, and consequently glean positive results, is a good indicator of a SNF who is willing and able to reach out and build collaborative relationships that strengthen the value proposition for their referral networks. As networks continue to narrow, skilled nursing facilities must have the capability to develop their own continuum of care partnerships. SNFs that continue to struggle with a silo approach are likely to face challenges related to forming strategic relationships with referral sources, upstream/downstream partners and other members of the post-acute continuum. Clinical Grand Rounds can foster a culture of interdisciplinary communication and shared responsibility that will ultimately improve a facility’s likelihood of successfully building and maintaining strategic partnerships within the post-acute care continuum. Contact the Clinical Strategy Division at HealthPRO®/Heritage to learn more about establishing Clinical Grand Rounds at ClinicalStrategies@healthpro-heritage.com or for more solutions related to managing silos and/or cross-continuum collaboration. Also, refer to recent Advisor publication “A SNF Operator’s Self Test: Five Factors That Will Most Likely Impact The Future Of Your Facility” for additional information.